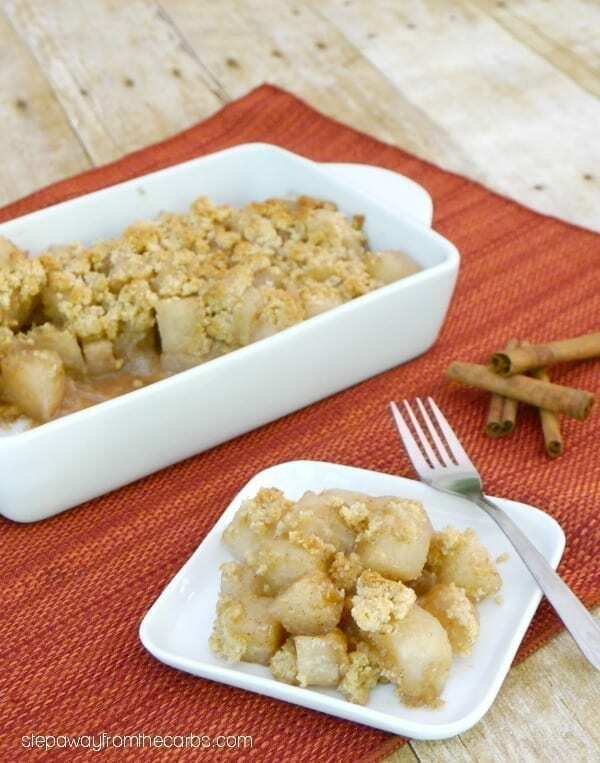 This faux apple crumble is made with jicama, instead of apple! 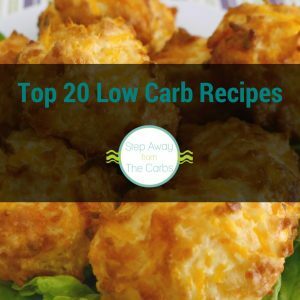 Low carb, sugar free, and gluten free recipe. 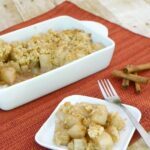 I was inspired to make this dish after I recently re-took photos for my yummy Rhubarb Crumble. As I was finishing revising the post I sighed to myself and thought “if only I could make a classic British APPLE crumble”. And then light bulb moment. In my Low Carb Chocolate Recipes book I made a fake chocolate apple dessert by sautéing JICAMA in butter, cocoa powder, sweetener and cinnamon. 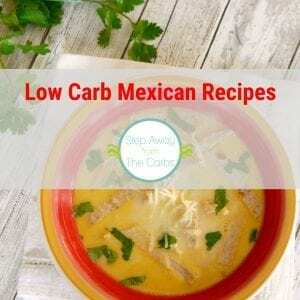 It was delish – and although the jicama stays crisp, this handy low carb vegetable REALLY works in a sweet dish. A-ha! Another light bulb moment! 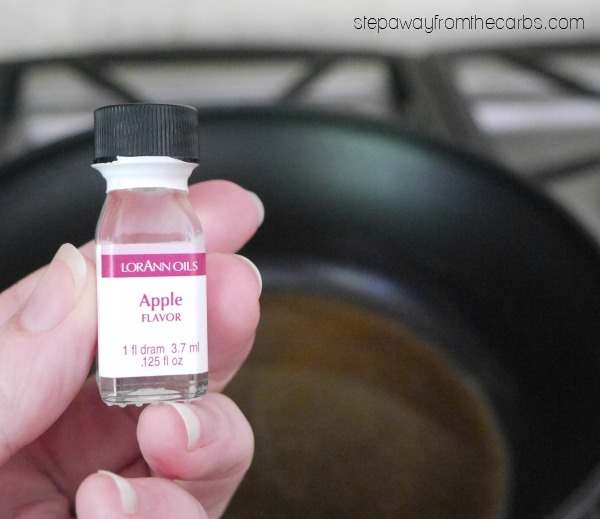 Since I made that fake apple dessert, I discovered the power this Apple Flavor Baking Oil when I made the awesome Low Carb Donut Bites with Apple and Cinnamon. The pack contains two small vials – and you only need half of one vial for this recipe! This combination was going to be EPIC – I could tell. And although a hot day in July was not the traditional time of year to experiment with this recipe – I just had to get started! 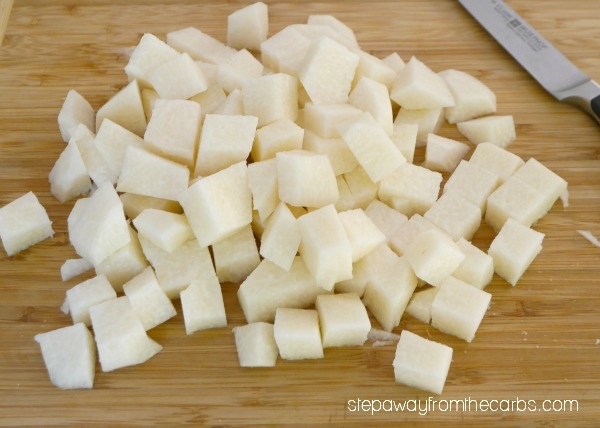 To make the base, peel a large jicama and cut it into chunks (my jicama was about 2lb, and 1.9lb when peeled). In a large saucepan, add unsalted butter, low carb sweetener (I used xylitol), ground cinnamon, and that awesome apple flavor. When a sauce has formed, add the jicama, stir well, then cover and cook for 15 minutes. 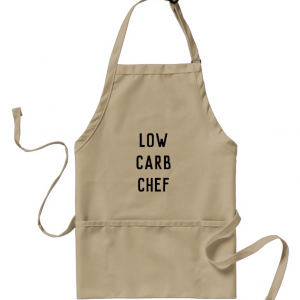 Meanwhile, make the topping by mixing low carb sweetener, flaxseed meal, and almond flour together. Add in some cold butter and crumble it together with your fingers, mixing the butter into the flour until large breadcrumbs form. 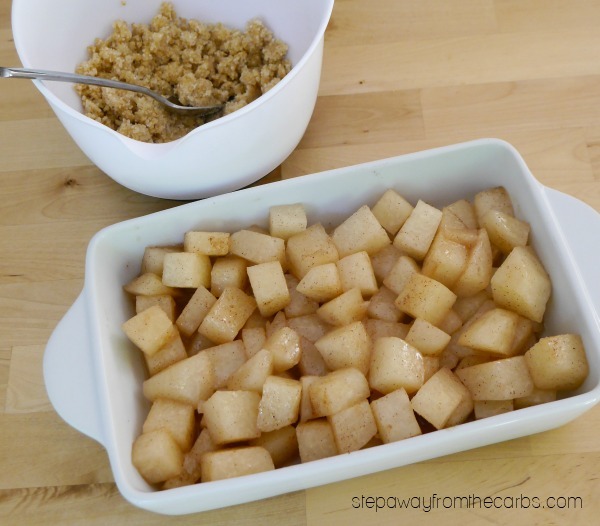 Transfer the jicama with its sauce to a baking dish – it will smell amazing! Then spread the topping over the jicama – it doesn’t have to cover it completely. Cover with foil and bake in a preheated oven for 15 minutes, then remove the cover and continue to bake for another 5-10 minutes or until the topping has turned golden brown. The texture of the jicama is like a crisp apple – but the combination of flavors with the butter, cinnamon, and crunchy topping is as good as I could have hoped for! 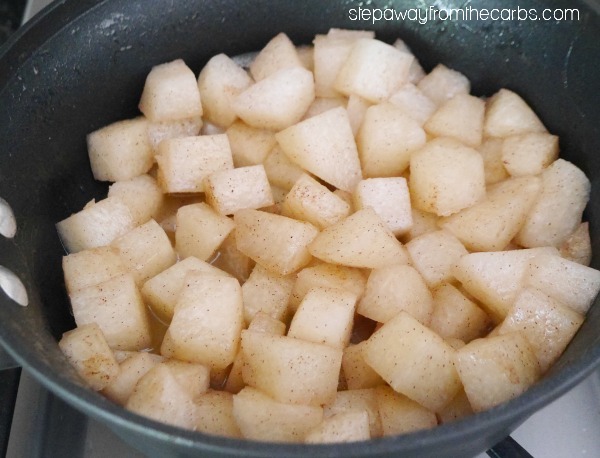 A low carb twist on the classic British dessert - using jicama instead of apple! 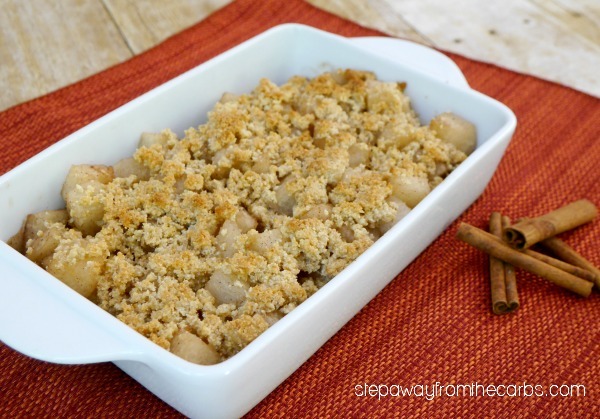 In a large saucepan, add unsalted butter, sweetener, ground cinnamon, and the apple flavor. Meanwhile, make the topping by mixing the sweetener, flaxseed meal, and almond flour together. Add in some cold butter and crumble it together with your fingers, mixing the butter into the flour until large breadcrumbs form. Transfer the jicama with its sauce to a baking dish, then spread the topping over the jicama. Cover with foil and bake for 15 minutes, then remove the cover and continue to bake for another 5-10 minutes or until the topping has turned golden brown. 8g net carbs per serving (one sixth of whole recipe). Does not include sugar alcohols from the sweetener. And yes, I *do* get the irony of this recipe that jicama isn’t widely available in Britain – but sorry – I just had to try and see how it turned out! I’m thinking that if I write enough jicama recipes they might make it available! I believe cooking time might be shortened. 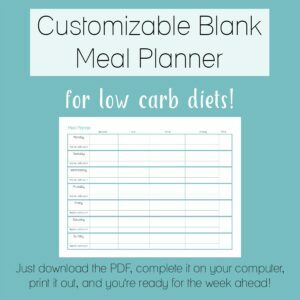 Do you think using ground chia instead of ground flax would make much difference? I’ve honestly never used ground chia as an alternative for flax. I don’t think it would affect the carb count too much but no idea bout the texture I’m afraid! It’s a root vegetable often used in Mexican cooking – so depending in where you live it might not be available! I’m in the Midwest, and can find it easily in grocery stores. I’VE MADE MOCK APPLE PIE WITH CHAYOTE SQUASH AND IT REALLY DID TASTE LIKE APPLE PIE. NO ONE COULD GUESS WHAT IT WAS. AND IT DOES NOT NEED TO BE PEELED. i’M MAKING THIS RECIPE NOW AND WONDERED IF THE SQUASH WOULDN’T HAVE BEEN EASIER TO WORK WITH, (CUT MY FINGER PEELING THE JICAMA, OUCH). I’ve never tried chayote squash but I’ve heard good things about it! Good luck with that jicama!